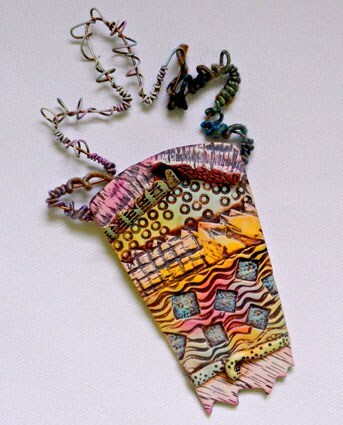 Shop Compass for holiday gifts such as one-of-a-kind polymer clay jewelry by Christine Damm. Saturday, Dec. 5 at 12 p.m. — BRANDON —With December and the holiday season comes many warm and comforting delights. Among them, tea, hot cocoa, sweets and shopping! Come to the Compass Center’s “Delights of December” holiday reception on Dec. 5 from 12 to 5 p.m. for some holiday cheer and all those warm December delights. Listen to Christmas family favorites from yesteryear in the Phonograph Museum, browse the gift shops and “The Art of Giving – : – The Giving of Art” holiday show, plus shop the Compass Treasure Chest and local farmer’s market. The café will also be open, serving lunch. The Compass book store has a wide range of new and used books, while the classical music store supplies you with the extensive collection of CDs from the international classical recording company, the Divine Art Recordings Group. Divine Art produces everything from easy listening to the avant-garde, featuring orchestral, vocal and instrumental music and specializes in the rare and rediscovered music. Christmas collectibles, note cards, candles and music ephemera are also abundant within the Compass stores. Support your local creative community by shopping for one-of-a-kind gifts in the “Art of Giving – : – the Giving of Art” holiday show. Featuring the works of local artists, find fine art/photography, stunning jewelry, textiles, women’s accessories, and holiday ornaments all at affordable prices. There are all sorts of treasures to be found in the Compass Treasure Chest, from toys and house wares, to clothing, tools and furniture. The local farmer’s market also gives you great ideas as well as necessities for dinner, including canned goods, fresh baked breads, cookies, fudge, produce, grass-fed beef, and more. The Compass Music and Arts Center is located in Park Village at 333 Jones Drive, Brandon. For more info, visit www.cmacvt.org.